It rained all night. I could hear the rain coming down on the roof and I was very happy that my motorcycle was tucked away in a locked garage compliments of the hotel. I stayed at Algoma's Water Tower Inn & Suites http://watertowerinn.com/ and hat tip to Mike who worked at the front desk for making it happen. 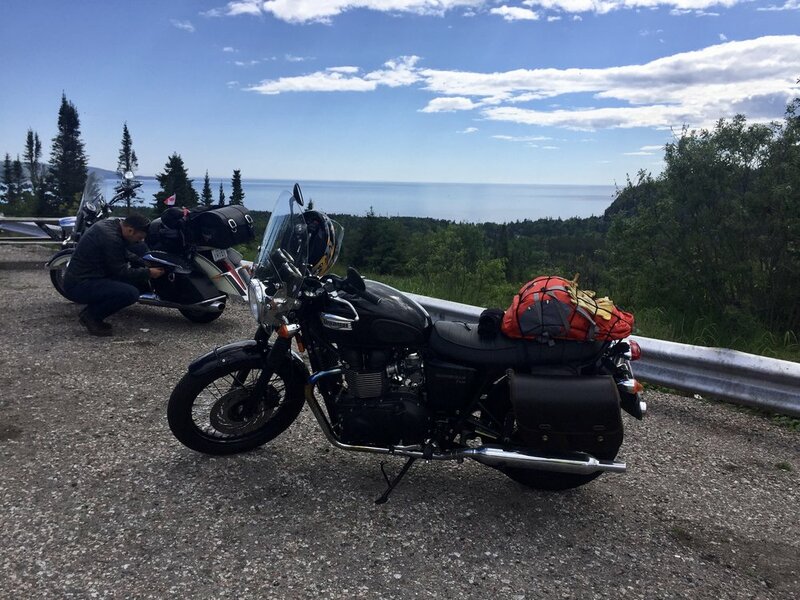 Northern Ontario is stunningly beautiful with well maintained roads with curves and turns, climbs and descents, navigating through rock faces, deep valleys and lake views. I've long been inspired by Lake Superior ever since I learned how to play "The Wreck of the Edmund Fitzgerald" by Gordon Lightfoot https://youtu.be/9vST6hVRj2A on the guitar. It's a powerful ballad and the perfect soundtrack for this leg of the trip. It was smooth riding until WaWa (cue "wah wah" music clip). I took the off ramp to WaWa to get some lunch and to see the town. WaWa is famous for this Goose. And then it started pouring rain and I was soaked. I stopped into the local Tim Horton's for some hot chilli and a coffee and to wait out the rain. But the bad weather was persistent, a combination of rain, mist and fog. I decided brave it with the help of my new rain gear. Which worked as promised. It was too bad that I was already damp from earlier. My destination promised better weather. Moose remained a danger with signs posted regularly along the highway. There were even signs with solar panels attached so that the signs would light up at night to warn travellers. As I was riding I remained vigilant and actually saw 3 moose! The first sighting was a mother (cow) and her baby (calf) on the left side of the highway standing still and watching me ride by. Another 45 minutes down the road and I saw another moose cow on the right side of the road standing still. The locals were right! There are moose EVERYWHERE! I don't have a photo because I didn't want to chance an encounter with an angry mother. The rain finally subsided and it cleared up enough to take off my rain gear. I had another tool in my arsenal to make riding more comfortable, a heated vest. This is a must have for riding in cooler weather. It plugs into the battery on your motorcycle to keep you warm and it works like magic. No more shivering for me. Pro tip: remember to unplug when you want to get off your motorcycle for a photo or get gas. At a scenic lookout point I met Julian from Kitchener-Waterloo. Julian was doing the Lake Superior Circle Tour. He has previously lived in British Columbia and had lots of tips for places to ride in Interior BC. He was camping at the parks in the area and was ready to call it day. I had another 150 km to ride. Julian is kneeling beside his bike on the left. I arrived in Thunder Bay by 8 pm and checked into the Days Inn North. It had been a challenging and rewarding day.